VietNamNet Bridge – So far this month, northern mountainous province authorities have detained 56 people allegedly involved in the destruction of 18.6ha of forest in total, Vietnam News Agency reports. These serial offences took place in Dien Bien Province’s Muong Nhe District, an area populated by ethnic minority groups and that is rife with deforestation activities, mostly of the slash-and-burn type. Out of the 56 detained, police forces and relevant authorities have commenced criminal proceedings against 16 people involved in 15 cases of deforestation. On March 11 alone, investigations were launched into 4 deforestation cases. According to existing law, one found to be guilty of destroying over 0.3ha of protection forest will be on trial. During this period, the authorities have either persuaded and enforced 70 nomad residents from 22 households that have immigrated into the area to return to their previous homes. 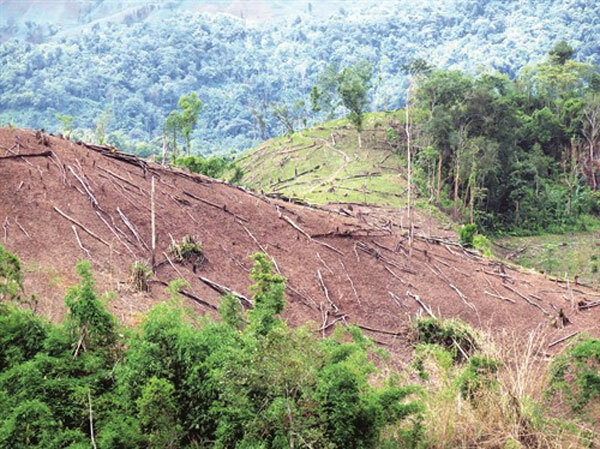 Dien Bien provincial People’s Committee has said that the deforestation is getting “more and more complicated”. In 14 months, from October 2015 to December 2016, the provincial authorities have discovered 186 deforestation cases causing a total loss of 175ha of forest, including 87ha of protected forest. To address this situation, starting from the beginning of the month, concerned agencies have started to step up their efforts to curb this serious violation of natural resources. Awareness raising campaigns are also given a boost to educate ethnic groups regarding State laws and regulations concerning forest protection. Most mountainous regions in the north of Viet Nam are economically challenged, and local authorities will not be able to ensure livelihood and necessity supply for an unexpected number of nomads arriving in their jurisdiction ‘outside of the original plan’. In addition, ethnic groups that have nomadic lifestyle will likely engage in slash-and-burn agriculture, which they might not even know is illegal. Once they have exhausted a place’s natural resources, they will start to relocate elsewhere, starting the vicious cycle again, the agency reported.